Awards & Community Recognition : Okun Financial Group, Inc.
Kathie was the recipient of the Ruby Award, once again, for 2017. This award demonstrates the achievement of significant income levels in both the financial and insurance services industry based upon production levels in the previous year. This is the third year that Kathie has received this award (Kathie also received the Ruby Award in 2014, 2015 and 2016). Women in Insurance & Financial Services (WIFS) is a professional 501(c)6 organization which attracts women in the financial services and insurance industry. WIFS develops businesswomen further by sharing resources, support, and tools to thrive in the workplace. Collaborative networks, mentorships, and constructive feedback build the foundation for the dynamic organization. At the Hornor, Townsend & Kent 2016 annual conference, Kathie H. Okun, CLU, ChFC, LUTCF was awarded the 2015 Blue Chip award. Kathie is the first woman in the 169-year history of Hornor, Townsend & Kent (HTK) to receive this award. Kathie is the founder of Okun Financial Group in Hunt Valley, Maryland. The HTK Blue Chip Award is presented each year to the one individual who best exemplifies the principles of HTK and Penn Mutual. The advisor must be a top sales performer and demonstrate the highest level of integrity in meeting the needs of his or her clients. He or she must possess a strong sense of commitment to their clients and to Penn Mutual and its broker/dealer Hornor, Townsend & Kent. This prestigious, annual award recognizes an HTK advisor for high standards of integrity, ethics and performance in helping clients achieve financial security. "Our Blue Chip award is given to an advisor with a proven track record of excellent customer service and compliant business practices. I've had the pleasure of knowing Kathie for many years and she's always gone the extra mile for her clients. She's also the first female advisor in our company's history to receive this award from Hornor, Townsend & Kent," said Michael Williams, Assistant Vice President, Business Development and Agency Integration, Penn Mutual. Kathie H. Okun, CLU, ChFC, LUTCF has been in the financial services industry for thirty years. Her success is attributed to building strong relationships with her clients while presenting effective ideas and strategies in a style that makes it easy for her clients to understand. Throughout her career, Kathie has maintained the highest level of professionalism, integrity and leadership. She holds multiple designations from The American College of Financial Services, attended UMBC and holds a Retirement Income Planning Certificate from the University of Pennsylvania, Wharton School of Business. Over the course of her career she has received other awards for her outstanding service in her industry. Kathie said “Winning the Blue Chip award was an overwhelmingly emotional experience and completely unexpected. I am still in shock,” ...When asked about how she was feeling. “I'm not one to look for or seek out accolades for the work that I do with my clients. All I want is to help my clients take care of their families,” she added. The HTK Blue Chip Award is presented each year to the one individual who best exemplifies the principles of HTK and Penn Mutual. In doing so, the advisor must be a top sales performer and demonstrate the highest level of integrity in meeting the needs of his or her clients. 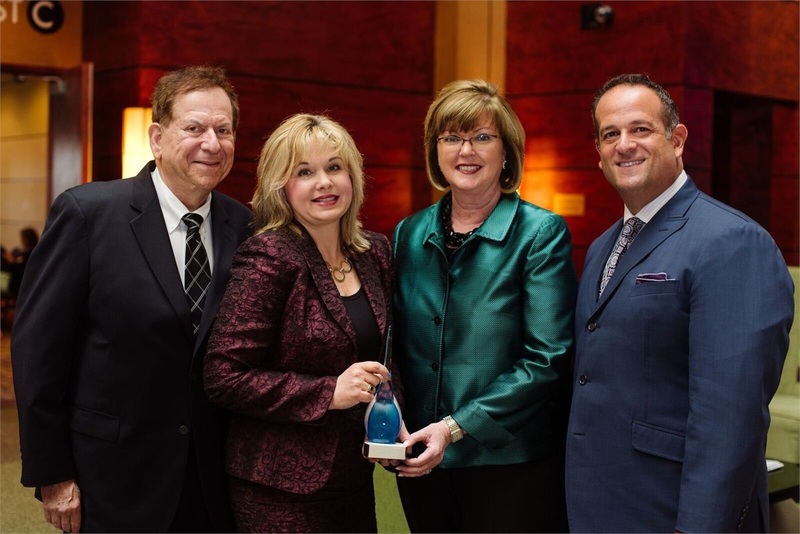 Kathie Okun was named a 2013 Brava Award Winner by SmartCEO Magazine in July. This award features top female entrepreneurs in the Baltimore area who not only achieve great things in the workplace, but who are giving back to their community as well. The Brava Award is based on Kathie Okun's experience as a business leader in the community and is not related to the financial services she offers. WPO is a collaborative network of women business leaders that seek to support and advise each other. A non-profit membership organization, members participate in specialized advisory groups in order to promote exceptional businesses. Baltimore Chapter II meets monthly and emphasizes in local opportunities for women and business leaders alike. Kathie Herbst Okun, Founder and President of Okun Financial Group, has been appointed to the Board of Directors for The Women's President Organization (WPO). WPO is a premier membership organization for women presidents, CEOs, and managing directors of privately held multimillion-dollar companies and nonprofit organizations. Through global, confidential, and collaborative peer-learning groups, the WPO accelerates business growth, enhances competitiveness, and promotes economic security. It is the ultimate destination for successful women entrepreneurs. WPO has over 120 chapters around the world learn more and find a chapter near you here. Kathie has been a proud and active member of the WPO Baltimore Chapter since 2013. Kathie has served on membership, the WPO annual conference and annual leadership retreats over the years. Kathie was very instrumental in leading the mission to bring the WPO Global Conference to her home town of Baltimore in April, 2016. The mission and purpose of the WPO is to improve business conditions for women entrepreneurs and to promote the acceptance and advancement of women entrepreneurs in all industries. Kathie has a core focus in her financial advisory business for women in business. Encouraging, educating and guiding women as successful stewards of their money, finances, insurance and investments. Marsha Firestone, President of WPO announced the 5 new board members. Over 30 applications were received and the field is competitive. Kathie said in a statement “It is an honor to be selected among such incredible women, some of which are my peers, to sit on the board of WPO”. Please meet the new board members here. Kathie Okun, CLU, ChFC, LUTCF is the President and Founder of the Okun Financial Group, LLC, a financial services firm in Lutherville, Maryland. Kathie has been a respected member of the insurance and financial services community for 29 years. Retirement planning for individuals and estate and succession planning for business owners are her specialties. Kathie has a strong commitment to her clients and has built her practice through client-based referrals. Monica Smiley, publisher and CEO of Enterprising Women magazine, announced the winners of the 2014 Enterprising Women of the Year Awards, an annual tribute to top women entrepreneurs from North America and around the globe. The award honorees were recognized during a two-day event held March 2-4, 2014 in Sarasota, FL, USA. The annual Enterprising Women of the Year Awards, which recognizes the finest women entrepreneurs in North America and beyond, is in its 12th year. It is widely considered one of the most prestigious recognition programs for women business owners. To win, nominees must demonstrate that they have fast-growth businesses, mentor or actively support other women and girls involved in entrepreneurship, and stand out as leaders in their communities. Many of the honorees also serve as leaders of the key organizations that support the growth of women's entrepreneurship. Award winners were recognized in six categories this year: annual sales revenues of more than $25 million; annual sales revenues of more than $10 million and up to $25 million; annual sales revenues of more than $5 million and up to $10 million; annual sales revenues of more than $2 million and up to $5 million; annual sales revenues of more than $1 million and up to $2 million; and annual sales revenues of up to $1 million. *To qualify for consideration a nominee must show financial strength and business success. prove they are a leader in there community and provide mentoring. A panel of judges reviews the nominations, conducts interviews and selects those who receive the award. The award can only be won once. There is no fee for the nomination or selection.